How do you make the R22 twice as good as it already is? Well Robinson did it by doubling its number and doubling its seating capacity to come up with the R44. 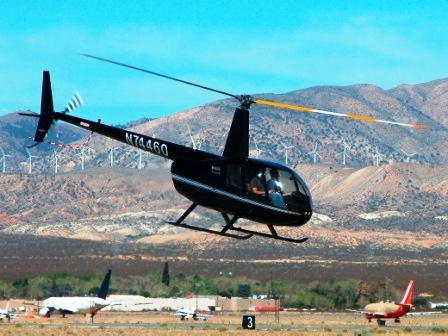 Not everything was doubled on the R22, the engine horsepower went up to 245 provided by a six cylinder IO-540 Lycoming. The R44 was an instant hit with helicopter operators and seemed to be a practical alternative to the Bell Jet Ranger series of helicopters (though not as capable in all respects as the Bell). Like the R22, the R44 is comparatively cheap to operate and they have found a home in the bush doing everything R22s do plus serving as sightseeing platforms too. Like the R22, the R44s also have somewhat peculiar flying characteristics that are much vilified by pilots who have never flown them and not a concern to seasoned Robinson pilots. Thingys on the hill are Chinook rotors captured by space aliens and displayed on poles as warnings to ward off itinerant helicopter pilots from flying over alien bases (no, not really). Watch this short video clip on how not to depart in a Robinson R44 helicopter. Here is a video of cattle mustering in an Robinson R44 helicopter in North Queensland, Australia.